I used MAC Abalone Shell as a base, with American Apparel Hassid for the frames of the glasses, as well as the eyes and outline of the nose. For the shading/mouth line, I used a mix of MAC Abalone Shell and Nubar Milk Chocolate Creme. For the lenses of the glasses, I mixed Sally Hansen All the White Stuff with Orly Snowcone, and for the unibrows, I used Nubar Milk Chocolate Creme for all but the ring finger, which I used CND Electric Orange mixed with a touch of the Nubar Milk Chocolate Creme, also, for the teeth I used Sally Hansen All the White Stuff. I topped everything off with two coats of Seche Vite top coat because who doesn't like shiny geeks. When I saw this in my feed I thought it was Arthur! Ok, time to show my geeky side. I have an 80 mage on the Spinebreaker realm for World of Warcraft...her name is Faylay. Does it count that I put my daughter in an "I <3 Optimus Prime" shirt today? try http://en.wikipedia.org/wiki/Towel_day and learn the real name/explanation. you'll get a lot more cool points. I love the monobrows on some of them! Very Extra Most Ultra Fabulous! I know about 110 digits of pi from memory :-P I am a true math geek!!! Star Wars Day! (Sorry, Guide bored me). Your ring finger looks like a young Bill Gates. Good one Melanie, I'm going to steal it. 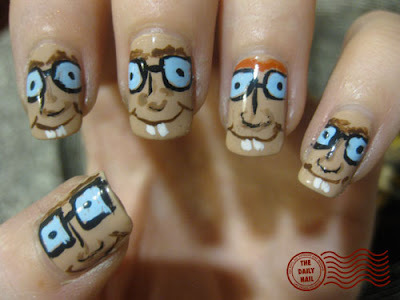 Haha I thought one of them was supposed to be Dexter from Dexter's Laboratory, but he doesn't have a unibrow or buck teeth.